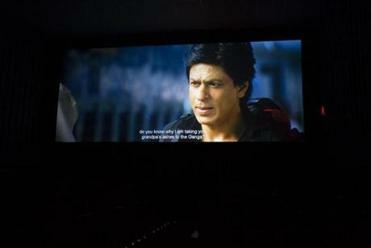 A scene from “Chennai Express,” one of the Bollywood movies that has been featured at Apple Cinemas at the Fresh Pond Mall. The lobby of Apple Cinemas movie theater. This spring, the movie theater at Fresh Pond Mall quietly took on the new name of Apple Cinemas. To most moviegoers, it appeared that not much else had changed; Hollywood titles adorned the marquee and the building looked unchanged. But a transformation was just beginning. Fresh Pond was going Bollywood, and beyond, dedicating significant resources to offering not only a full range of Indian movies but additional kinds of foreign-language films for underserved international audiences. Though Indian films had been screening at the theater for four years, they were largely seen only by viewers in the know. “We wanted to put Indian titles on the marquee, but there are always outstanding English [language] movies so they won’t have space. Or they misspell it,” said Jegan Gomangalam. Gomangalam and his business partner, Siva Stian, bought the North Cambridge movie theater at the beginning of this year, after renting a single screen there as independent movie exhibitors iMovie Café. 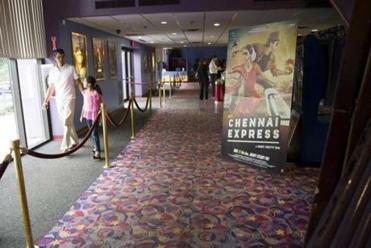 Since the closure of Bombay Cinemas in Allston in 2004, the Boston area has offered few dedicated spaces for fans to catch the latest films of stars like Shah Rukh Khan, Rajinikanth, Chiranjeevi, and Pawan Kalyan, or the music of A.R. Rahman (of “Slumdog Millionaire” fame). Apple Cinemas was the first Boston-area theater to play the latest Bollywood import, “Chennai Express.” (Several Regal and AMC theaters, which cherry-pick Bollywood titles with the most potential, have since added screenings of the movie at locations like Fenway and Methuen.) Starring the popular Deepika Padukone and Shah Rukh Khan (“Om Shanti Om”) and loaded with crowd-pleasing action sequences, “Chennai” has grossed more than $4 million in the US since its Aug. 8 release. “For those 2½ hours, you feel closer to home,” adds Saarthak, 29. Part of the draw is the communal theater scene, which at Apple means an engaged and raucous crowd. Families, couples, and groups of friends fill the rows, excitedly chatting through the trailers until the movie begins. They cheer when the hero makes his first appearance, boo when the villain gets his way in the second act, and whistle and clap when characters launch into a musical number. Gomangalam says for Thursday and Friday night premieres, it’s not uncommon for the crowd to throw confetti when a lead actor like Aamir Khan or Mahesh Babu enters the story. According to the 2010 Census, some 3 percent of Cambridge residents identify as South Asian, slightly higher than the state average of about 1 percent. Stian and Gomangalam considered another South Asian community in Framingham before choosing their current Cambridge location for its access to public transportation and proximity to colleges with many foreign-born students. iMovie Café describes its audience as mostly students and young professionals, more than half of whom are originally from India. But the range of films now being programmed at Apple Cinemas seems to offer something for every age and moviegoing taste. With the success of their Telugu and Tamil imports (recent bookings include “Thalaiva” and “Yevadu”) and a need for popular Bollywood movies to fill out the schedule, Stian and Gomangalam arranged a series of mergers that pooled the other longstanding exhibitors, Bombay Cinema and Aap Ka Manoranjan, under the iMovie Café company umbrella. Hindi, Telugu, and Tamil films now generate about 4,000-5,000 ticket sales per month at Apple Cinemas, according to Gomangalam. A Bollywood ticket ranges from $11 to $13, but the theater offers a discounted price of $4.75 on all Tuesday shows. Gomangalam estimates that iMovie Café has evolved to screening about 75 movies per year, on a same-day release schedule with India. But creating an international movie haven is a work in progress. Gomangalam and Stian are renovating the theater to replace its well-worn seats and amenities. Their first technological upgrade, converting to digital projection, brought its own set of problems. A view of the screen inside one of the movie theaters at the Fresh Pond Mall. Monica Castillo can be reached at mcasti8485@gmail.com.